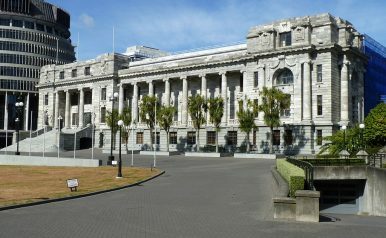 Parliament House in Wellington, New Zealand. On September 23 — a month from now — New Zealanders head to the polls to cast their votes for the country’s next parliament. The National party, led by Prime Minister Bill English, will be seeking to hold on to the government for the fourth straight election and ultimately hopes to finally seize an outright majority in the 120-member parliament. Back in 2014, when voters went to the polls in the last general election, National missed a majority by one seat. As the authors of a new book from ANU Press — A Bark But No Bite: Inequality and the 2014 New Zealand General Election — note, despite broad discussions about inequality during the 2014 campaign, those concerns didn’t have much of an impact on how New Zealanders voted. As Jack Vowles, a professor of comparative politics at Victoria University of Wellington, tells The Diplomat, voter perception of competence in the leading National government and skepticism that the opposition could form a solid coalition, trumped policy concerns. Catherine Putz: For readers unfamiliar with the nuances of New Zealand politics, can you describe the political landscape leading up to the 2014 general election? Jack Vowles: A National (centre-right) led government had been in office since 2008, getting credit for New Zealand’s relatively easy ride through the global financial crisis and quick recovery. The major opposition party (Labour) was suffering from unstable and unpopular leadership, and had lost votes at the previous election in 2011. There was increasing concern about social and economic inequality in New Zealand, offset by a lot of complacency. The two other opposition parties, the Green Party and New Zealand First, were often more effective at gaining public attention than Labour. In the months leading up to the election, the Labour Party refused to clearly state an intention to seek a coalition with the Green Party should it be in a position to form a government. In combination with poor polling for Labour, this significantly diminished public confidence that an alternative government arrangement would be stable or sustainable. On election night in 2014, it looked like the National Party would at last seize an outright majority of seats in the house for the first time — though in the final count National was one seat short of plurality — what’s significant about that milestone? At the final count, the National Party was one short of a majority. Of course, a majority government is very hard to get with a proportional (MMP) electoral system. It would have been the first single-party majority since 1996, and given the government a lot more power to do what it wanted. That said, one seat for the allied ACT party gave the government an effective majority, although this was quickly lost again because of a by-election won by the leader of an Opposition party, New Zealand First. After that, for a majority National required the votes of either one United Future MP or those of the Māori Party’s two MPs. In your book, you argue that the National Party’s strong suit has been the perception of its competence. How did National cultivate this perception? Why are other parties, like Labor, unable to achieve such a perception? Perceptions of National Government competence was a result of a combination of luck and good management. Labour left office in 2008 having paid down government debt, leaving National plenty of room for counter-cyclical stimulation of the economy. The Christchurch earthquake and the need to rebuild the city gave National a further chance to be perceived as effectively managing a crisis. It is very hard for opposition parties to demonstrate competence — that said, one of National’s key strategies was to attack and destroy confidence in the Labour leadership by fair means and sometimes foul. Partly as a result, the Labour leadership was unstable and changed twice after 2011. National Party Prime Minister John Key provided much of the government’s reputation for competence with his unflappable political style and his ability to smooth down potential crises. You note that National catered to “middle ground voters” — can you describe these voters? Middle-ground voters tend to be middle-income voters, and people whose opinions are “middle of the road” or in the center on economic and social policy issues. What were the issues driving the 2014 election and how do they compare to those being discussed with regard to the upcoming general election? In many ways 2017 is about many of the same issues: the economy, inequality, and related matters. There is more concern now about better public funding for health and education and more chance Labour can mobilize votes around higher spending on such public services. Labour has also shifted to a new and more dynamic leader, Jacinda Arden, while National’s Bill English lacks the pull of former National Party Prime Minister John Key who stepped down towards the end of 2016. There is also more emphasis on the need for New Zealand to address climate change in the aftermath of the Paris agreement, with Labour and the Green Party arguing for much stronger action. Polls has shifted in Labour’s direction, although National remains the most popular party. But it may be unable to form a government after the election with its current allies. Tougher Times Ahead For New Zealand’s Next GovernmentMeet Bill English, New Zealand’s New Prime MinisterNew Zealand’s Ardern Tours Polynesia, What About the Politics?Strange Bedfellows Down UnderNew Zealand's Next Government: What's at Stake?